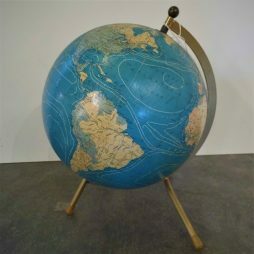 Mid-Century Collectables | Interior Boutiques – Antiques for sale and mid century modern furniture, french furniture, antique lighting, retro furniture and danish furniture. 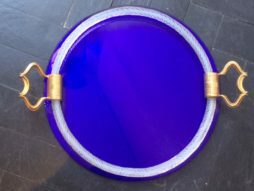 Unusual round glass tray in electric blue colour with Murano glass rope inner circle and brass handles. Italian. 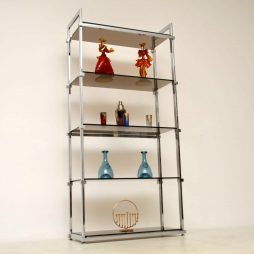 A magnificent vintage shelving unit in chrome and glass, this was made by Pieff of Worcester and it dates from around the 1960-70’s. 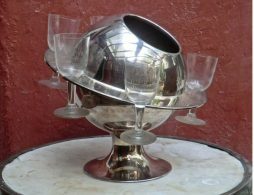 The quality is amazing and the condition is excellent for its age, there is just some extremely minor wear to the chrome here and there. 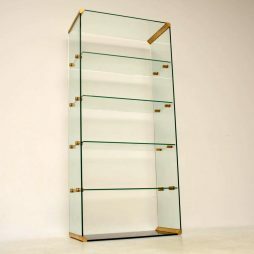 This is nicely finished on the back as well, so can be used as a free standing room divider. 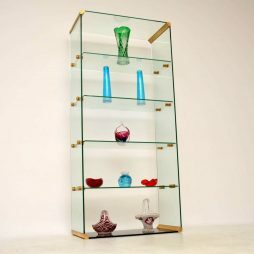 A stunning and extremely well made vintage cabinet, this is almost entirely made from thick toughened glass, with brass corner supports and brass shelf supports. 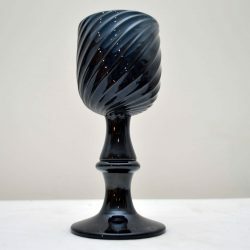 It was made in Italy and dates from around the 1970’s. 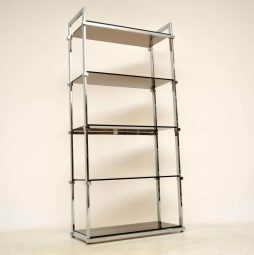 A truly impressive piece, this is identical back and front so can be used against a wall or as a free standing room divider. 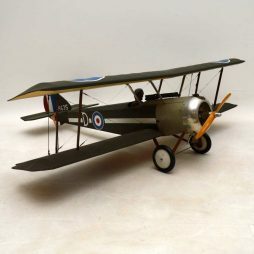 This large vintage model aeroplane has a real engine & is a replica of a RAF fighter biplane that was in action around the time of the 1st world war or soon after. It was made to fly & for all I know the engine could still work. 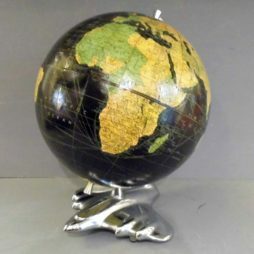 I was told that it was made in the 1960's, but it's very hard to age exactly, because the details are so good. Please enlarge all the images to see all those details. Maybe it had some sort of remote control. 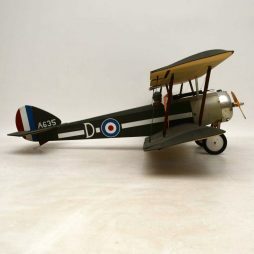 You can look up the actual original fighter plane it's replicating, because the RAF A653 D did actually exist. Please check the measurements, because it is quite large. 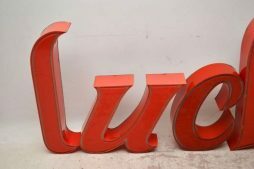 A fantastic and rare set of large light up letters, imported from America and originally from an old diner. They are original from around the 1950-60’s, and have been re-wired to modern standards, all letters full light up. 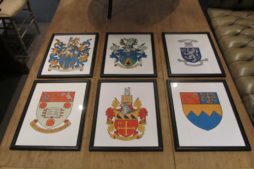 We have another two letters, the R and R, available for sale separately. 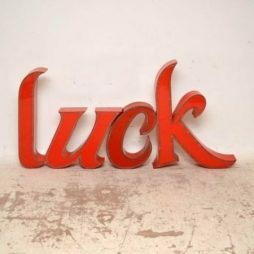 There is an image included of them lit up on this listing, that is what the ‘Luck’ looks like when switched on. There is a scratch on the letter ‘U’, seen in the images, otherwise they are all in great condition for their age, with only some minor wear. 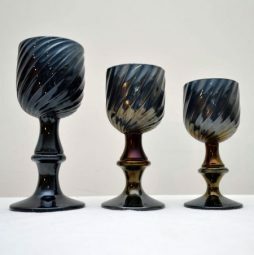 An amazing set of three wine goblets, these were made in Murano Italy by master glass maker Pino Signoretto. 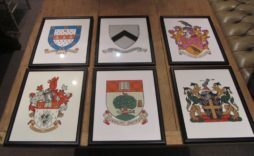 They are in superb condition, and each is signed on the base by the artist. 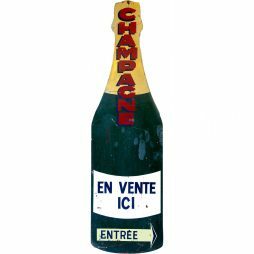 Large Vintage Champagne Enamel sign in shape of a giant bottle. Coming from France, the sign is lettered 'En Vente Ici' (For Sale Here) and came from a champagne 'Cave' near the city of Reims in the champagne growing region. Protruding metal 'lugs' on the back of the sign for fixing it in place. in good condition with some surface rust on the reverse side. Measures 61 inches high x 18 wide. 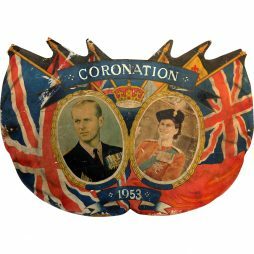 Original 1953 cut out card Sign for the Coronation of the Queen. 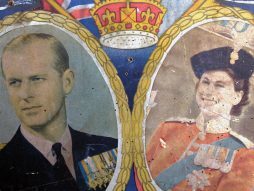 Shows photographic images of Queen Elizabeth and Prince Philip set inside oval frames with British flags and crown. Very few of these coronation signs survive now so a genuine collectors item. In reasonable condition with some wear and tear. 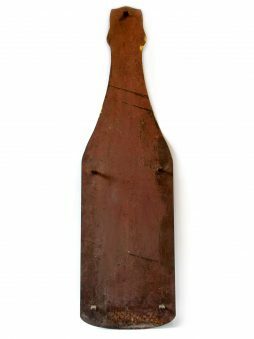 Measures 27 inches wide x 19 high. 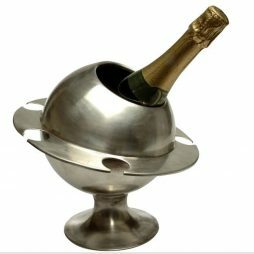 Rare and desirable French Vintage Champagne Ice Bucket in nickel plate with surrounding ring that has bitten out slots to hold 6 champagne or wine glasses. 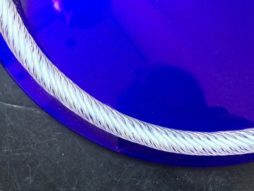 Known as Saturn Ring in honour of our famously ringed planetary neighbour, the bucket was one of a small production made in France by the Michel Dartois company of Paris, circa 1960-1975, and only turn up nowadays very occasionally.